Good oral health is an essential component which determines the overall general health of children. Despite improvement in oral health, the prevalence of dental caries remains high in young children as reported by the United States National Health and Nutrition Examination Survey. Previous studies conducted on the prevalence of dental caries among school going children in United Arab Emirates (UAE) showed it to be considerably high,  inferring that the trends are toward poor oral health in children of this population. The aim of this study was to evaluate the proportions of completed treatments and to study the factors affecting the full mouth dental rehabilitation in pediatric patients treated by undergraduate students at the College of Dental Medicine Teaching Clinics, University of Sharjah. This study was conducted on 270 children who attended the pediatric dentistry clinic at the University of Sharjah. The children were aged less than 12 years with a mean age of 7.6 years (SD: 2.04). The sample comprised 154 boys [mean age 7.3 years (SD: 2.1)] and 116 girls [mean age 7.8 years (SD: 1.9)]. This study was carried out after obtaining approval from the Research and Ethics Committee, University of Sharjah, in accordance with the Helsinki declaration. Parents signed informed consent form and were willing to comply with the treatment plan. Undergraduate dental students were required to complete comprehensive dental rehabilitation of child patients in their final year of training in Pediatric Dentistry. Two hundred and seventy reports from the year 2009 to 2011 were reviewed. Healthy children whose age ranged from 3 to 12 years were included. Complete history taking, oral examination, dental charting, and treatment plan were performed in pediatric dentistry case sheets by dental students in their final clinical years, under the supervision of calibrated pediatric dentists. Dental caries was charted using WHO 1997 criteria. Completion of dental care delivered was monitored by the supervising dentists till case completion. The dental treatment needs for children involved in this study were assessed using DMFT/deft scores. The completion of dental care delivered was determined by comparing pretreatment DMFT/deft scores with completed treatment scores. Preventive procedures were provided to all participating children in this study, which included biannual application of topical fluoride, oral hygiene and diet instructions. In addition, factors affecting dental rehabilitation in children aged 3-12 years were evaluated. Mean and standard deviation of the gender wise distribution of number of decayed teeth was assessed. 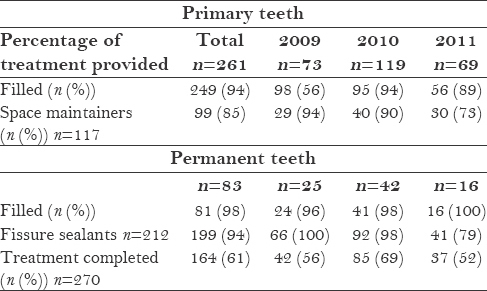 Frequency of completed treatment determined by number of decayed teeth that were filled and the space maintainers provided was also assessed over the 3-year period. Independent t-test was also used to assess the relationship between treatment completion (complete coded as 1, incomplete coded as 0) according to the number of decayed teeth, in both primary and permanent dentition. Additional multivariate logistic regression analysis was used to assess the relationship between treatment completion and students' grade, children's age (<5 years, >5 years old), children's gender, and number of decayed teeth. All analyses were conducted using SPSS version 20, in which significant alpha level was 0.05 (two-tailed). Distribution of the sample in reference child's gender/age and mean decayed primary and permanent teeth are presented in [Table 1]. A total of 270 children were examined in the present study of whom 9 were free of dental caries. The percentage of decayed primary right and left second molars was 58% (lower) and 44% (upper), while that of permanent first molars was 20% (lower) and 16% (upper). Two hundred and sixty-one children had dental caries in the primary dentition; the percentage of fillings provided to them was 94% and of 117 spaces present, space management was undertaken in 84% of the children. Caries in permanent teeth were observed in 83 children (%) of whom 98% had restorative treatment completed. Fissure sealants were provided on the first permanent molars on the indicated teeth; 212 children required this preventive procedure of whom 94% obtained sealants. 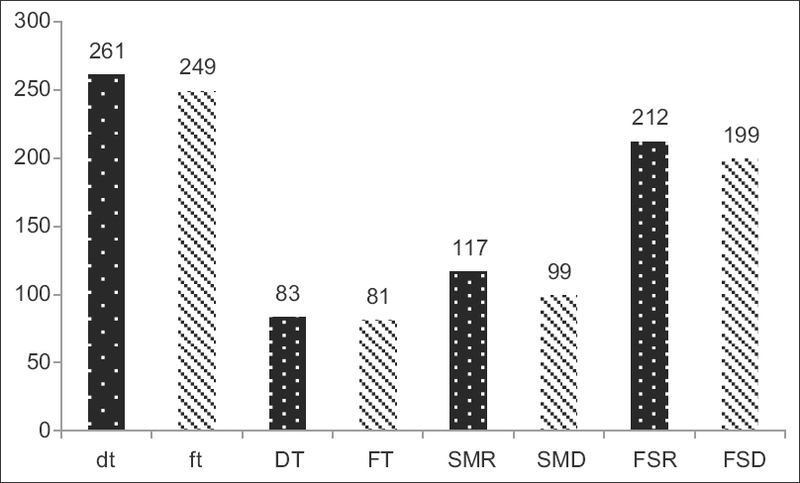 While examining the sample for completeness of dental treatment which included sealant placement, it was observed that 61% of the total 270 children had complete dental treatment [Table 2] and [Figure 1]. Treatment completion according to number of decayed teeth indicated that of 270 children examined, treatment of 61% (n = 164) children was completed. The average number of decayed teeth among uncompleted cases was significantly higher than that of completed cases [Table 3] (completed: Mean dt = 4.4; uncompleted: Mean dt = 6.1; P < 0.05). Analyzing completeness of care in permanent dentition, 126 children's treatment was complete including the placement of sealants. There was no significant difference in mean baseline decayed permanent teeth between complete and incomplete cases (P > 0.05). Predictors of treatment completion were determined based on logistic regression analysis. Age of the child and the number of decayed teeth present before the start of the treatment significantly correlated with treatment completion [Table 4]. Thus, increase in one decayed tooth was associated with a significant decrease in the odds of treatment completion [odds ratio (OR): 0.78, 95% confidence interval (CI): 070, 0.87; P = 0.000]; furthermore, children older than 5 years were significantly less likely to have their treatment completed compared to younger children (OR: 0.5.0, 95% CI: 0.25, 0.99; P < 0.05). Encouraging percentage of restoration done on children suffering from early childhood caries is in line with recent rationale and recommendations. Space management was undertaken in 85% of the children requiring this treatment which included supervision and space maintainers; year wise distribution of this treatment was >70%. Space maintainers were offered to children in the present study to minimize the development of malocclusion in the permanent dentition. On the contrary, since space maintainer appliances are plaque retentive, they predispose to dental caries development and gingival inflammation. However, in the present sample, space maintainer appliances were provided when required, for balancing occlusal disturbance. The findings of this study indicate that children with incomplete treatment had a higher number of decayed teeth in primary dentition at baseline, compared to those who completed their treatment. These findings could suggest that at screening, children with a relatively high number of decayed teeth must be identified and arrangements must be made to increase the likelihood that these children receive all necessary treatments. Since increasing the clinical hours based on patients' needs may not be a practical approach in an undergraduate teaching clinic, the assignment of children with high number of decayed teeth to two students could improve the percentage of treatment completion. It is important to determine the integration of the academic information and clinical teaching among dental students, which could be improved by incorporating contextual teaching. Contrary to previous reports,  our findings do not show a correlation between students' overall academic performance and treatment completion. These findings underscore the importance of clinical assessments, which clearly reflects the skills and attitudes that may not be captured by the overall academic performance of dental students. The percentages of preventive, restorative treatments offered were high with over 60% of children obtaining complete oral care. Higher pretreatment dt and DT, and children older than 5 years were factors affecting full mouth dental rehabilitation in children of age 3-12 years. This holistic approach of dental care will perhaps enhance the quality of life of children attending College of Dental Medicine training clinics. The authors would like to thank Dr. Seren Ghassan Aldadah, clinical attachment in Pediatric Dentistry for her assistance during data entry. Beltrán-Aguilar ED, Barker LK, Canto MT, Dye BA, Gooch BF, Griffin SO, et al. ; Centers for Disease Control and Prevention (CDC). Surveillance for dental caries, dental sealants, tooth retention, edentulism, and enamel fluorosis-United States, 1988-1994 and 1999-2002. MMWR Surveill Summ 2005;54:1-43. Hashim R, Thomson WM, Ayers KM, Lewsey JD, Awad M. Dental caries experience and use of dental services among preschool children in Ajman, UAE. Int J Paediatr Dent 2006;16:257-62. Armfield J. Oral health of teenage children in South Australia. Aust Dent J 2009;54:166-9. Rich JP 3 rd , Straffon L, Inglehart MR. General dentists and pediatric dental patients: The role of dental education. J Dent Educ 2006;70:1308-15. World Health Organization. Oral Health Surveys: Basic Methods. 4 th ed.. Geneva: WHO; 1997. p. 40-5.
al-Banyan RA, Echeverri EA, Narendran S, Keene HJ. Oral health survey of 5-12-year-old children of National Guard employees in Riyadh, Saudi Arabia. Int J Paediatr Dent 2000;10:39-45. Hashim R, Williams SM, Thomson WM, Awad MA. Caries prevalence and intra-oral pattern among young children in Ajman. Community Dent Health 2010; 27:109-13. Hashim R, Williams S, Thomson WM. Severe early childhood caries and behavioural risk indicators among young children in Ajman, United Arab Emirates. Eur Arch Paediatr Dent 2011;12:205-10. Wyne AH, Chohan AN, Jastaniyah N, Al-Khalil R. Bilateral occurrence of dental caries and oral hygiene in preschool children of Riyadh, Saudi Arabia. Odontostomatol Trop 2008;31:19-25. Finucane D. Rationale for restoration of carious primary teeth: A review. Eur Arch Paediatr Dent 2012;13:281-92. Makhija SK, Childers NK, Lauten J, Dorantes CE, Chafin T, Dasanayake AP. Evaluation of initial caries score and caries incidence in a public health sealant program: A retrospective study. Pediatr Dent 2006;28:420-4. Welbury R. Summary of: Influence of dental care on children's oral health and wellbeing. Br Dent J 2013;214:568-9. Stewart CJ, Moloney EJ, Kinirons MJ. Clinical experiences of undergraduate dental students in pediatric dentistryat Cork University Dental School and Hospital, Ireland. J Dent Educ 2010;74:325-30. O'Sullivan D, Hooper S, McNally L, Jagger D. The introduction of a new assessment system in restorative dentistry: The undergraduate and patient experience. Eur J Dent Educ 2007;11:54-9. Whelton H, Crowley E, O'Mullane D, Donaldson M, Kelleher V, Cronin M. Dental caries and enamel fluorosis among the fluoridated and non-fluoridated populations in the Republic of Ireland in 2002. Community Dent Health 2004;21:37-44. Camargo MB, Barros AJ, Frazão P, Matijasevich A, Santos IS, Peres MA, et al. Predictors of dental visits for routine check-ups and for the resolution of problems among preschool children. Rev Saude Publica 2012;46:87-97. Tickle M, Milsom KM, Humphris GM, Blinkhorn AS. Parental attitudes to the care of the carious primary dentition. Br Dent J 2003;195:451-5; discussion 449. Isong IA, Zuckerman KE, Rao SR, Kuhlthau KA, Winickoff JP, Perrin JM. Association between parents' and children's use of oral health services. Pediatrics 2010;125:502-8. Elkind A, Blinkhorn AS, Blinkhorn FA, Duxbury JT, Hull PS, Brunton PA. Developing dental education in primary care: The student perspective. Br Dent J 2005;26:198:233-7.